Reboots: There was a time when you needed a few decades in between. Nowadays there’s barely enough time to put your foot on the ground before we’re winding up to punt another franchise up the arse. Ross McG and Ross McD pit two modern remakes against each other. Remember when it used to be cool to be an X-Man? Back in the days before Great Power got diluted with the very boring Great Responsibility (Thanks for ruining everything, Spider-Man’s uncle), being a superhero was pretty sweet. And being an X-Man was the sweetest superhero gig of all. You could make obscene gestures with your middle adamantium claw… you could break into the White House… you could even control the weather with your eyes! These were fun times. It’s a shame then that the latest bunch of mutants to use Brand X are as whiny as fame-hungry celebrities who moan about getting their picture taken. The major problem with X-Men: First Class is its laziness. ‘Oh, humankind is so mean to us,’ wail the likes of Scream Boy – sorry, Banshee – who is just slightly less memorable than the banshee in Darby O’Gill and the Little People. 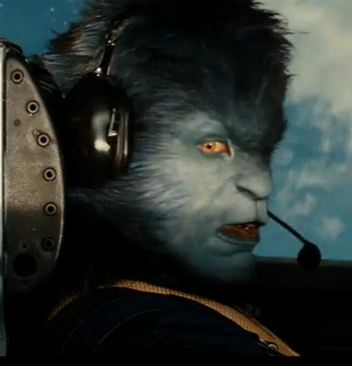 However, there isn’t one instance in the film in which humans are depicted being mean to mutants. In fact, the CIA gives them jobs without so much as an interview… so what are they moaning about? None of the little brats thought to use their powers when their new employers were being systematically murdered in front of them. ‘Mutant and proud’? Proud of being the most boring mutants in X-Men movie history? Yes, even more boring than Jean Grey. And Gambit. Poor Mystique, she used to be such a great character. Unfortunately, in First Class, she’s lost all her… uh, mystique. Scream Boy made me want to cover my eyes, not just my ears, while Buzzy Girl Who Spits Crap Out Of Mouth is the most embarrassing superhero character since Arm Fall Off Boy. And the guy who is… good at… adapting to things? There are plug sockets that can do that! There are promising elements in First Class, but every conversation between Magneto and Professor X is cut short just as it gets interesting, obviously to make sure the 12-year-olds in the audience don’t start getting bored by the seven seconds that doesn’t have something blowing up. Yet even in the actions stakes, First Class falls short. It doesn’t have one ‘wow’ moment. And while a Magneto: Nazi Hunter movie might have been good, there’s still no excusing his shoddy accent change once he starts shouting. Can’t wait for the inevitable chain of O’Magneto’s Irish pubs that will follow this film. Star Trek, on the other hand, had never been cool until JJ Abrams’ exhilarating reboot. His movie had more excitement in its stirring opening sequence than First Class does in its entire running time. While the X-Men resorts to a lame and needless cameo, Star Trek has the balls to give Leonard Nimoy a chunky role in proceedings. And not just because he directed Three Men And A Baby. That’s right, Leonard Nimoy directed Three Men And A Baby! Spock. From Star Trek. Directed Three Men And A Baby. Forget about First Class. Watch Three Men And A Baby. Leonard Nimoy directed it. It’s class. As both an X-Men and Star Trek fan, I always get excited when a new film from either franchise comes out. Well, it had become a bit diluted for Star Trek since a new film seemed to come out every couple of months. But when man of the moment JJ Abrams got behind the helm for the reboot I’ll admit my excitement returned. And for the most part he delivered. Casting was excellent; Chris Pine and Zachary Quinto as Kirk and Spock were perfect. So much so that as I recently (and belatedly) made my way through season three of 24, I wonder why Quinto’s character doesn’t simply apply his cold Vulcan logic whenever he faces a crisis. But Star Trek felt like it was missing something… what was it?…. oh yeah, a believable enemy. Just like with the ending in Lost Abrams completely forgot to write it. While Eric Bana does ‘disgruntled stare’ very well, what the hell was his character all about? The guy who tried to save my planet failed, so now I’m going to blow up the universe. I mean, I get grudges, but come on? Who’d serve under this guy, with his stupid Mike Tyson tattoos? And don’t get me started on that Red Matter. I haven’t seen as much fretting about a missing red glob since Knocked Up. While Star Trek is decent, it is sub par to many of its predecessors including the Wrath of Khan, Nemesis and the superb First Contact. X-Men: First Class meanwhile is by far the best X-Men film of the series so far. Don’t get me wrong, X-Men 1 was OK and X-Men 2 was good (and included one of the greatest opening scenes ever); X-Men 3 was a bit of a mess and the less that is said about X-Men Origins: Wolverine the better. But in X-Men: First Class, director Matthew Vaughn has created the first X-Men film with actual characters, and not a queue of actors showing off their CGI powers one by one to keep the fanboys drooling. The pacing of the film is excellent, never lulling for a moment, but the key ingredient is the chemistry between James McAvoy and Michael Fassbender; the budding bromance between Professor X and Magneto is an intriguing watch. Normally comic fans protect their comic canon like cranky first-time mothering dragons, but sometimes modern film writers will actually make a better job of it. The tweaked origin stories are better than, say, a big alien called Lucifer dropping a big rock on Prof X’s legs. This entry was posted on June 14, 2011 at 5:50 pm and is filed under BATTLES with tags Captain Kirk, JJ Abrams, Magneto, Matthew Vaughn, Movies, Professor X, Spock, Star Trek, Superhero, X-Men, X-Men: First Class. You can follow any responses to this entry through the RSS 2.0 feed. You can leave a response, or trackback from your own site. Just got back from the cinema and totally digging on X Men right now so even though I loved Star Trek the Marvel geek in me is going to win this one. as ever, youre entitled to your opinion Katie. is that a Grease reference? star trek had a long2 story. i dont remember them at all. Woop! In your feeeeaaaaaace McG! I’m the one that she wants (I am the one she wants) Ooh ooh ooh honey! I’m going to wait thirty years for the nineties Star Trek: The Next Generation revival. That’s how it works, right? To quote John Travolta from another movie..
McD, you certainly said it with your last paragraph about the pacing, the bromance and altering the source material to make a better story 😛 Couldn’t agree more!! But this was one hell of a match up I still can’t decide which one I would choose over the other!